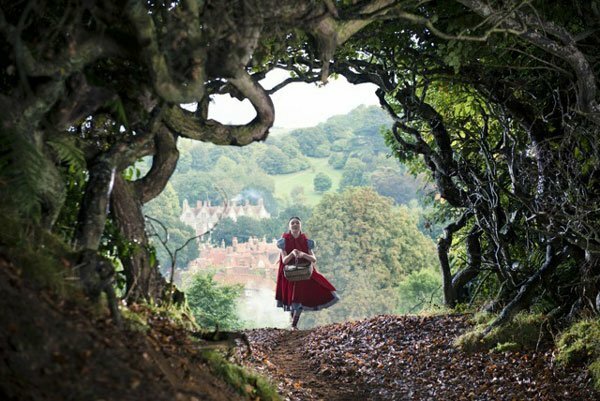 We've been reporting plenty on Into The Woods and the incredible cast that Disney has assembled for the live-action movie musical. Now, after months of having to repost that one mediocre picture of Meryl Streep looking like a retired Bellatrix Lestrange, we finally have an avalanche of new images! People has shared a slew, including the one up top that has the aforementioned Streep towering over a trembling James Corden as The Baker. But Corden, who is the hero of this movie based on the Stephen Sondheim Broadway sensation, gets a better close-up in the pic below. There he's with Emily Blunt, who plays the Baker's Wife. 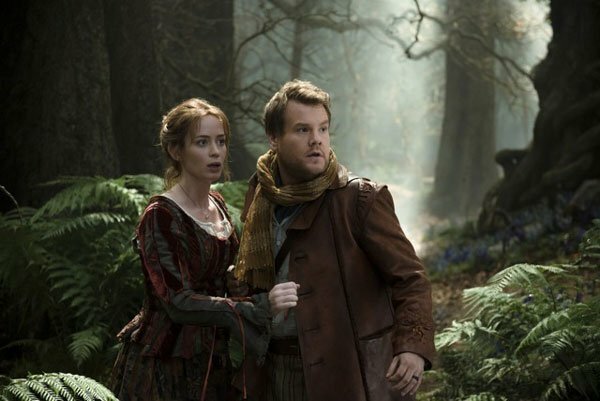 And can I just add that Corden looks downright dashing here? He's come a ways since his time as the bumbling roomie on Doctor Who. Next up comes a bit of romance in the form of Rapunzel, played here by Mackenzie Mauzy. 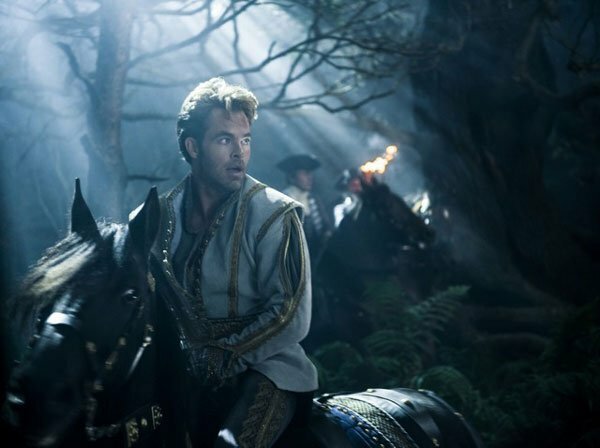 Following her is our first look at Chris Pine as Cinderella's Prince. Nice to know that hope is on the way for Kendrick's princess-to-be. And how about a shot of her evil stepmother and sisters, played by Christine Baranski (center), Lucy Punch (left), and Tammy Blanchard (right)? 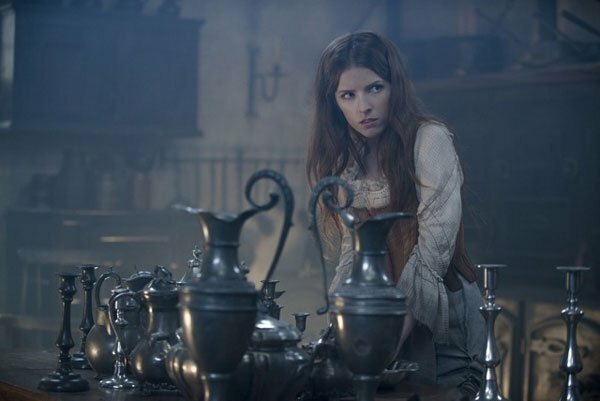 Clearly the story of Cinderella has a sizable role in Into The Woods. Here's a shot of Jack (of Beanstalk fame) and his mother, played by Daniel Huttlestone and Tracey Ullman, respectively. 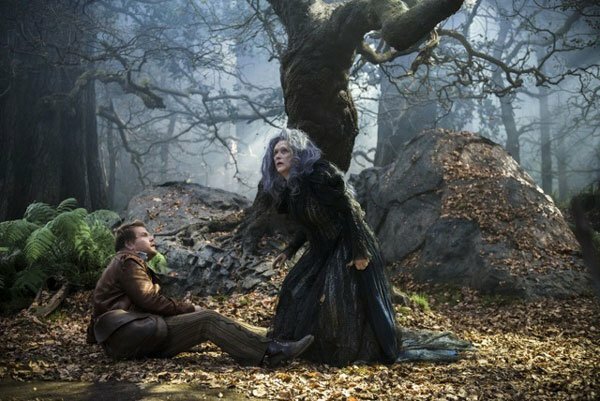 The new Into the Woods images even show us the ]controversial casting of little Lilla Crawford as Red Riding Hood. But where oh where is her Big Bad Wolf? Johnny Depp plays the role, but you couldn't tell in this infuriatingly coy first look at the character. But hey, at least we know he favors a fedora. Into The Woods opens December 25th.